The Ethiopian empire was founded not based on the will of its nations and nationalities. It was formed by force by elites from the north with help of the European powers. Since its formation, Ethiopia has never respected the interests of other nationalities in the empire. Today, as in the past, the empire is serving only elites from the Tigray, particularly TPLF and members of its pseudo organizations, while majority of ordinary people from other nationalities, particularly the Oromos, are languishing under its tyranny. Subsequently, the economic, socio-cultural and political exploitations have continued unabated. Tired of such tyranny, the Oromo revolutionaries and the youth has stepped up an uprising that has engulfed the entire nation since 2014. Though the responses of the TPLF security forces were brutal, killing hundreds of peaceful protesters and detaining tens of thousands, the protest has continued and even expanded to the Amhara regional state and to the southern Nations and Nationalities regional state. Desperate to control the people’s uprising, TPLF first declared a command post rule and then a state of emergency. However, neither of the command post nor the state of emergency has stopped the protest as TPLF hopes. 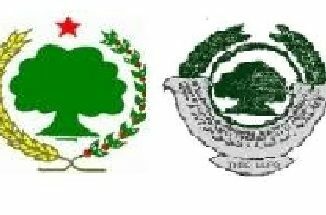 Today, there is no political order in the country especially in Oromia and Amhara regional states. Failed to control the situation in the country, TPLF and its pseudo allies used various strategies to silence people’s quest for freedom and democracy. 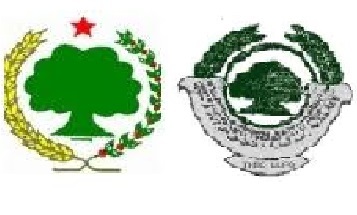 Since clinch on power, TPLF has been instigating a conflict along national and religion lines. Interestingly, after selfinstigating conflict using its undercover security agents, often it presents itself as a mediator while supporting one group with all sorts of logistics up to militarization. Subsequently, TPLF uses this self-instigated conflict as a propaganda on its statecontrol media to tell the people that TPLF is the best, perhaps the only, remedy for the state to continue as a nation. These are among the strategies that this minority group uses to stay on power. Contrary to this fact the TPLF and its dictatorial rule that are destroying the integrity of the country it claims to maintain. In Oromia, there are countless instances where TPLF intentionally created a conflict between Oromos and other ethnic groups such as Somali. The current “Oromo -Somali conflict” in East and west Hararge, Bale, Borena and Guji zones seem unique in its nature from previous incidents. A well-trained special police forces (aka Liyu police) solely composed of ethnic Somalis are the fore front of the conflict. This conflict, perhaps a war, has been going on for now three weeks and hundreds of innocent Oromo people have been killed by this special police forces. Although these special forces are composed of carefully selected ethnic Somalis, it is commanded by a TPLF general Abrhaa Qurater and is also enforced by TPLF Agazi Special Force. The Ethiopian government, as usual, is trying to divert this war as if it is just a conflict between Oromo and Somali farmers. Unlike previous conflicts, this is a large-scale war encompassing East and West Hararge, Bale, Borena and Gujii zones. It is also worth noting here that this Somali special forces are trained by Britain for a so called counter insurgency. The UK- and US-governments also finance the training and supported with all the logistics, which are now murdering innocent Oromo farmers in the East, south-east and southern Oromia bordering the Somali regional state. The TPLF government is using this special police forces, trained supposedly for counter insurgency, to raid just unarmed Oromo farmers. It not a simple conflict to ransack cattle and camels, as TPLF tried to present, however, it a war of ethnic cleansing by a well-trained police forces. Not only those directly involved in the war but also those who trained and armed them will be responsible for such atrocity on hundreds of innocent people. Our people are fighting back with what they have, but one should note that these are a well-trained and armed forces. 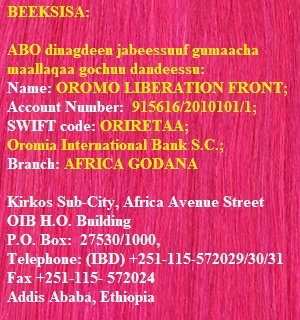 Thus, they need support from all Oromos in Oromia and across the globe. This is the time that we standup for the right cause, and show our support for those in dire need, putting aside our little differences. Thus, we call upon all Oromo in Oromia and in diaspora to stand with those who are facing the TPLF special forces with bare hand. 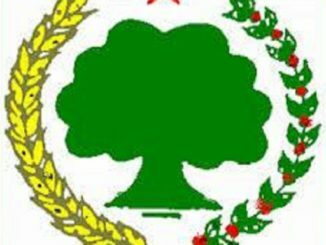 The only ever lasting solution we have at stake now is to remove TPLF from power for once and for all. This is possible only when we all united and act as one people for one goal, remove TPLF, the killer of our people. We also call upon all Oromos who are currently serving at various posts in police and military camps of the TPLF to turn their weapons against the enemy of your people. Those who supported the TPLF killing machinery financially as well as in logistics will not escape from accountability. Thus, we call upon the Western governments, specially the government of USA and UK who financially sponsored the training of such killing machinery should immediately withdraw their support and held the TPLF government accountable for all the killings and destruction. 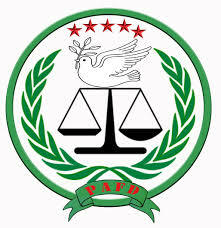 Finally, we would like to call upon all people in Ethiopian to stand together to bring an end to the TPLF tyranny.